This is the most recognized and fabulous path. It was made, over the centuries, by people who used it for passage from one town to another and in many parts it is a mule track. The path from Monterosso to Riomaggiore is about 12 km long and reaches a height of 200 meters at Prevo, a small but nice village near Vernazza. The itinerary is made up of 8 kilometres of paths, 2 kilometres of mule tracks, about 1 kilometre of streets inside the villages and the remaining kilometre is the famous “Via dell'Amore”. This is the La Spezia's C.A.I. number 2 path but is best known as the 'sentiero azzurro' (the blue path). The whole itinerary is marked by a white-blue stripe. You need about five hours to complete the full path, which has a difference in height between the lowest and highest position of 500 meters. Remember that the approximate completion time doubles if one decides to visit the villages. Perfectly, one should take a few days to do the itinerary stopping at each village. Photo of the Blue Path. Cost: you need Cinque Terre CARD. After 19.30 it is free. Also there is a light in the 1st part (Via dell'Amore). It was re-opened on 1 January 2012 after October Disaster. This path begins near the railway station of Riomaggiore (to the left from the exit). Alongside the path one can appreciate numerous kinds of stones and wild flora such as the pitosforo, agaves, the prickly pear cactus, and the Hottentots (imported from South Africa), which have all adjusted well to the closeness of the sea. The flight of martins and seagulls accompanies you on your trip. The path comes out to the station to the railway station of Manarola. To enter the village, you must walk in the tunnel (very similar to Riomaggiore), which has been ornamented with paintings, demonstrating the Cinque Terre, performed by the students of the Academia di Brera under the command of Lino Marzulli. 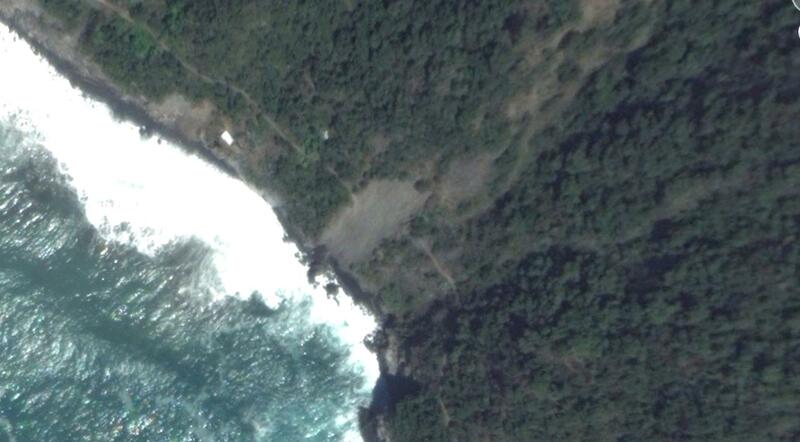 The height change along the path is only 30 meters. The path is closed for a long period (approximately till: April 2021). Why it is closed? Photo. The next path Manarola - Corniglia at the beginning will be very similar to the “Via dell’Amore” that you just left. It’s mostly flat, easy, that is, till you get closer to Corniglia. That’s when you appreciate that it's different from other four towns, Corniglia isn’t at sea level. It’s up on top of a cliff - you can take 382 stairs of Long Stair to get the village or take the easy way and wait for the bus directly on the exit of the railway station. It was re-opened on 19 June, 2012 after October Disaster. 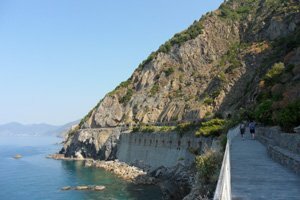 The path from Corniglia to Vernazza goes gradually down for the greatest part, although there are some very steep segments. Parts of the path are made up of irregularly-shaped stone steps which require a lot of care when you’re hiking. When you get near to Vernazza don’t celebrate your arrival too early, there is a sequence of very steep switchback steps running down into the town. It was re-opened on 6 April, 2012 after October Disaster. 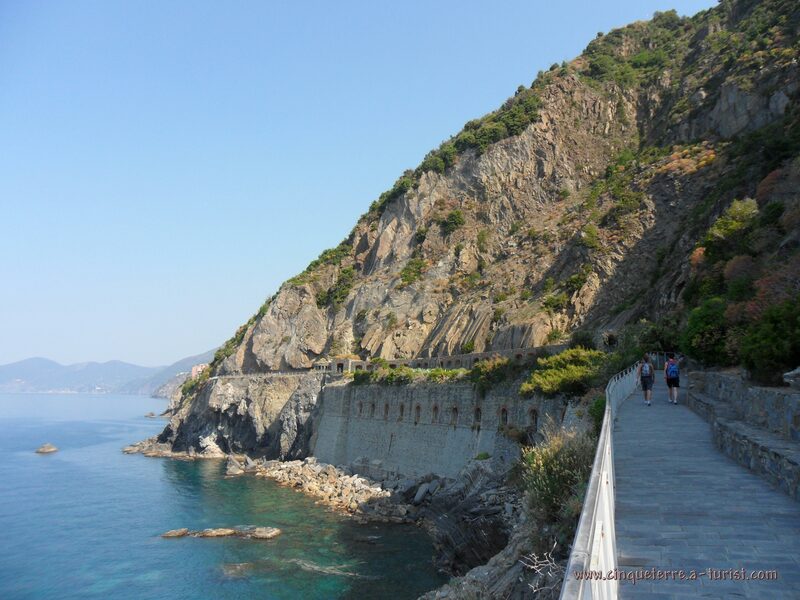 The most confronting hike is the one from Vernazza to Monterosso, basically because it’s not just up or down - it’s both and steep, so be ready for lots of stopping if the trail is very crowded. The good news - a forest landscape that you meet; it will capture your spirit, especially in the summer it’s very enjoyable to sit in the shade, watching the sea.